My summer was way too short, so I’m holding on to the season with the last watermelons and figs that I can find. Last Saturday, I bought the very last watermelon that the farmer’s market had in my neighborhood and it was delicious! This week, my nearby Stop and Shop has watermelons on sale, so let’s enjoy them before they’re all gone. Watermelon is an amazing fruit that is made up of 91% water plus vitamins A and C, potassium, and lycopene. One cup of watermelon has almost 2x the amount of lycopene in 1 fresh tomato! Figs are a great source of potassium, calcium, and iron. Since iron absorption is increased by vitamin C, the watermelon, lemon juice, and white grape juice in this recipe aid in the absorption of iron from the figs. The flavor of Spiced Watermelon Fig Popsicles bridges the end of summer with the beginning of fall. If you’ve already had enough popsicles for the season, you might enjoy this recipe as a smoothie instead! Blend first 6 ingredients until smooth and add enough grape juice to bring the total to 2¼ cups. 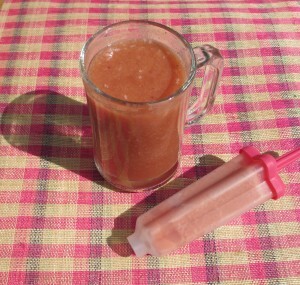 Blend once more to mix in juice and pour into popsicle molds. *Adjust honey according to sweetness of the watermelon. Also, remember not to introduce honey to children less than 1 year of age. 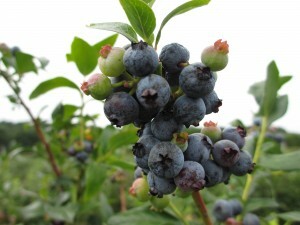 Last week, I enjoyed the simple pleasure of blueberry picking with friends. I brought home a little more than 1.5 lbs with the thought that I would use some to make a blueberry galette and simply add the rest to pancakes, cereal, and yogurt. I tried to save 3 cups of blueberries for the galette, but I’ve eaten almost all of the blueberries up. I especially apprecited Fresh Blueberries added to Greek Maple Yogurt! 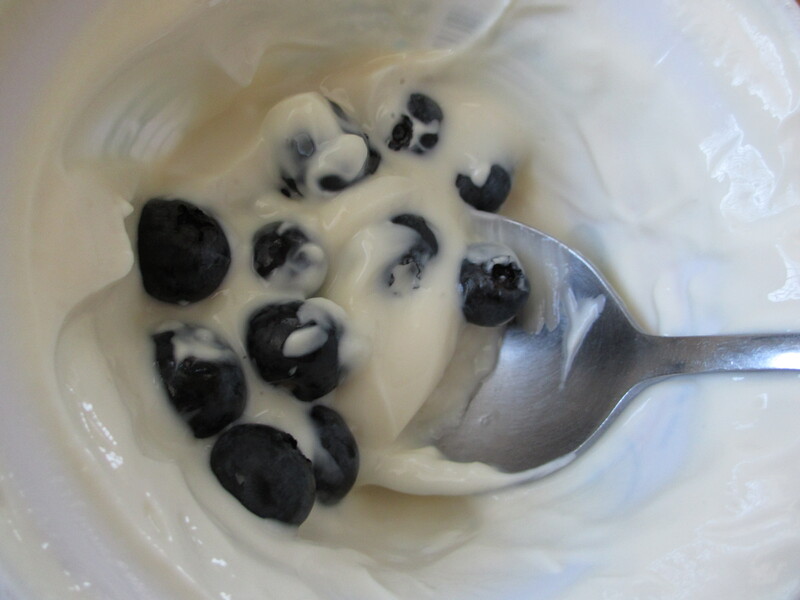 You can make Greek Maple Yogurt by mixing at least 1 Tbsp. maple syrup into a 6 oz. container of non-fat Greek yogurt. Frozen Yogurt Cookies were born after a friend of mine was disappointed that my last blog entry didn’t include a recipe. These are easy to make and add a special finishing touch to any meal. Choose thin, yet sturdy cookies to carry a spoonful of yogurt. A sturdy cookie is important, so that the yogurt’s moisture doesn’t soak through it. 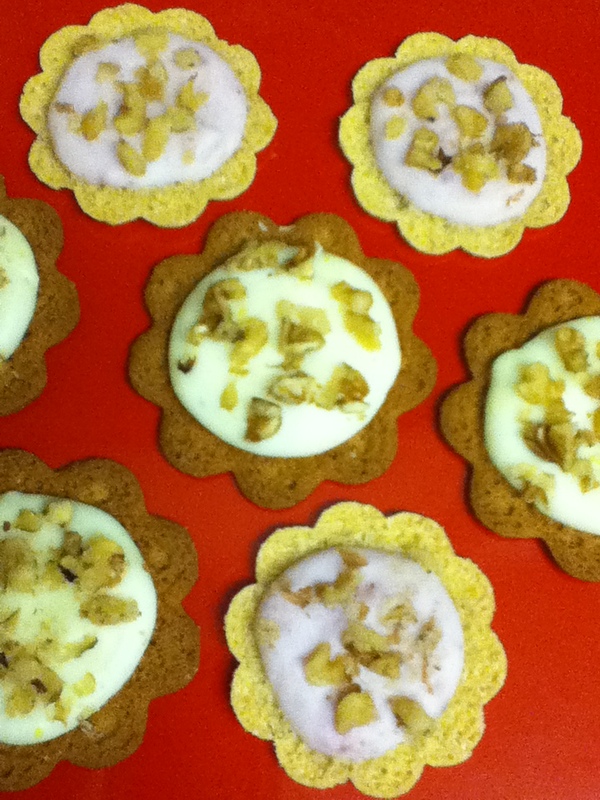 Sprinkle chopped walnuts on top of the yogurt and freeze the assembled cookies on an uncovered tray. They’ll be ready to eat in about 1 ½ hours. So, I’ve been extremely busy for the last 4 months as a dietetic intern. My experience working in the hospital has been wonderful so far, but my culinary creativity has suffered somewhat. I realized that my cooking is mostly inspired by the people I love, but they are home in NYC. 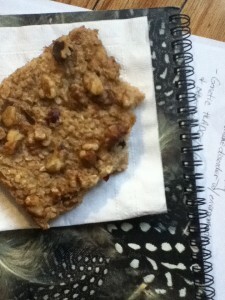 Grocery shopping here is also not as great as it is in NYC. I miss the overflowing variety! But today, I found a fairly new grocery store that made me feel more like I was at home. There was an assortment of foods at this market that made me feel that I might discover something exciting and new. Cascade Fresh yogurt grabbed my attention at 89 cents for every 6 oz. cup. After looking over the ingredients and nutrition facts, I happily welcomed the yogurt into my shopping basket. I applaud Cascade Fresh for making yogurt with only about 16g sugar per container of fat free yogurt. They use fruit juice to sweeten their yogurt and are able to create a product with much less sugar than most yogurts, which have about 26g sugar. The first flavor that I’ve enjoyed has been Green Apple Pie. If Cascade Fresh is not available where you shop, but you also want to lower your intake of added sugar from yogurt, try mixing plain yogurt with flavored yogurt. I was doing that for years. For more information, check out http://cascadefresh.com/. Do you remember that pumpkin I bought in October? It’s been sitting on my kitchen counter for 5 months. This past weekend, I finally cooked, pureed, and froze it for future use. However, I did set aside one cup of puree to make pumpkin bread. March is definitely not the season for pumpkin bread, but that didn’t stop me from baking one of my favorite autumnal treats. I love the warm flavors of cinnamon, ginger, nutmeg, and cloves in pumpkin bread, but I decided to use less of these spices because it’s springtime! 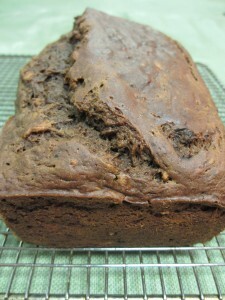 This pumpkin bread is so delicious and moist; no one would ever know there was whole wheat flour and flax seed meal in the mix! If you don’t have whole wheat flour and flax seed meal, just use 1½ cups all-purpose flour and 6 tablespoons of canola oil. However, this is a good recipe to start introducing fiber-rich whole wheat flour and omega-3-full flax seed meal into your diet. 1. Preheat oven to 350°F and grease a 9×5-inch loaf pan. In a medium bowl, whisk together first 9 ingredients. In a small bowl, combine milk and vanilla. 2. In a large bowl, beat canola oil, flax seed meal, and sugar until mixed well. Beat in one egg at a time and then mix in pumpkin puree. After each addition: one third of the flour mixture, followed by half of the milk mixture, another third of the flour, the remaining milk, and the remaining flour mixture, beat on low speed until just combined and scrape the sides of the bowl as needed. Fold in ¼ cup raisins. 3. 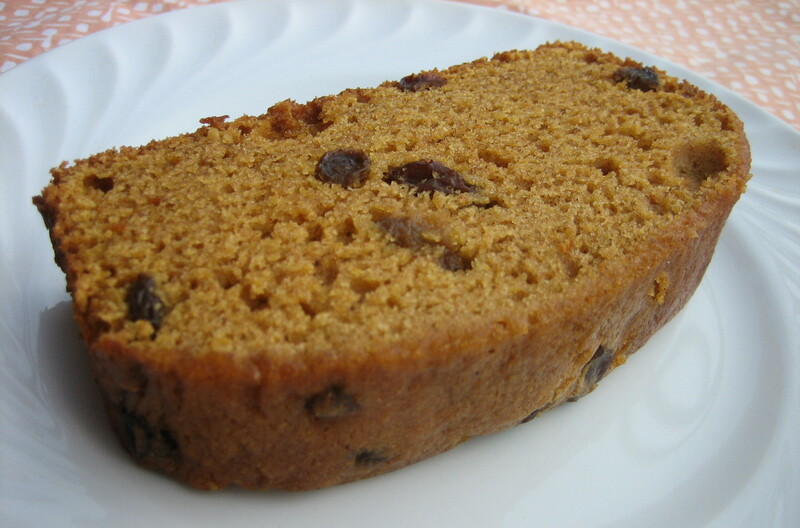 Pour into the loaf pan, sprinkle the remaining raisins on top, and gently press raisins down while spreading the batter evenly. Bake for about 1 hour or until a toothpick inserted in the center comes out clean. Let cool in the pan on a rack for 10 minutes before taking it out and cooling completely on the rack. 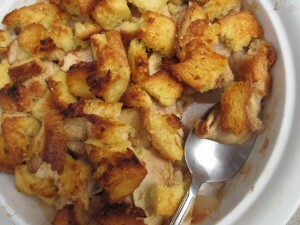 “Simply Delicious” signifies a recipe that uses only 3 to 5 main ingredients. 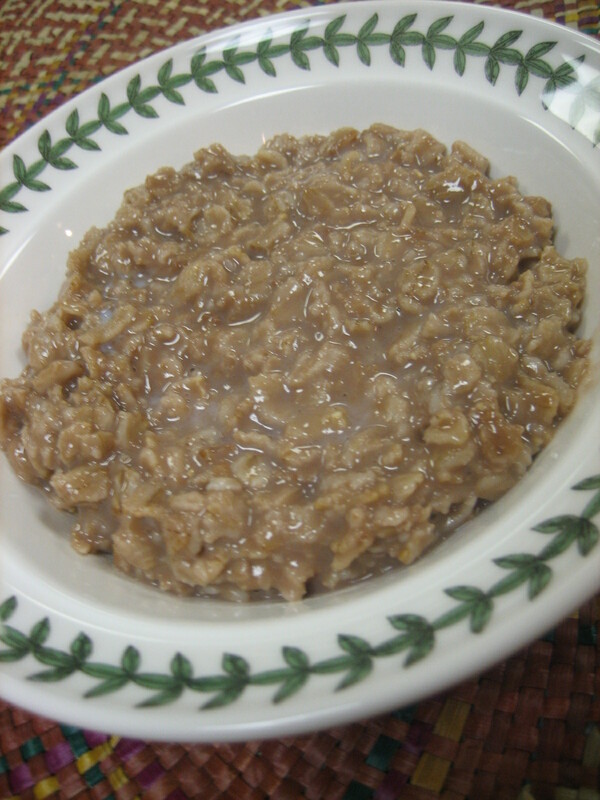 Chocolate Oatmeal is a breakfast that my mother made often when I was growing up. 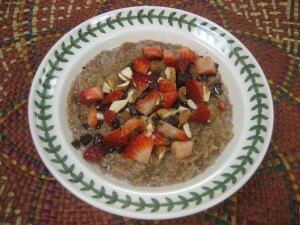 Her inspiration was Filipino chocolate rice porridge, champorado. She made her oatmeal with spoonfuls of Nesquik chocolate powder, but I make mine with a packet of hot cocoa. In a medium saucepan, bring water or milk to a boil over high heat. Add the oats and hot cocoa mix. Stir until hot cocoa mix dissolves and reduce heat to medium. Cook for 5 minutes, stirring occasionally. Serve with warm milk for pouring over the top. Enjoy it plain for a quick breakfast. Have a little more time? Add toppings. 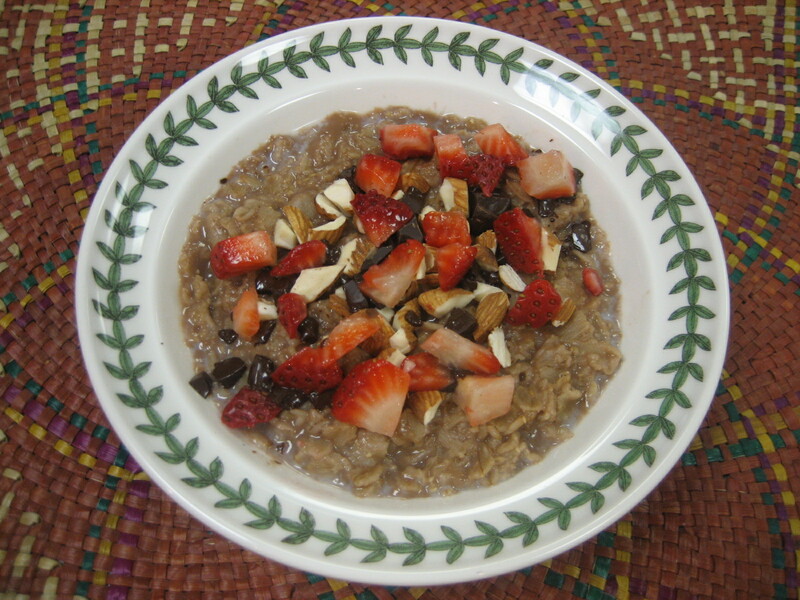 Try adding chopped semi-sweet chocolate, toasted almonds, and strawberries. 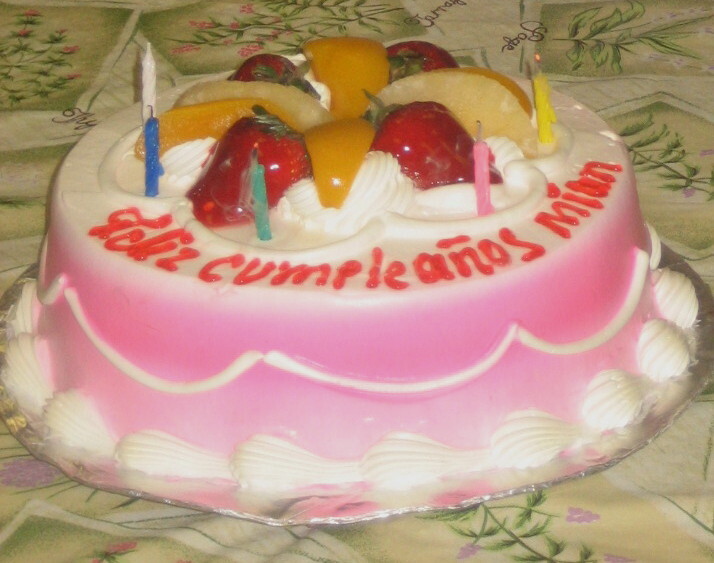 I think it’s a perfectly tasty and healthy breakfast for this coming Monday — Valentine’s Day!